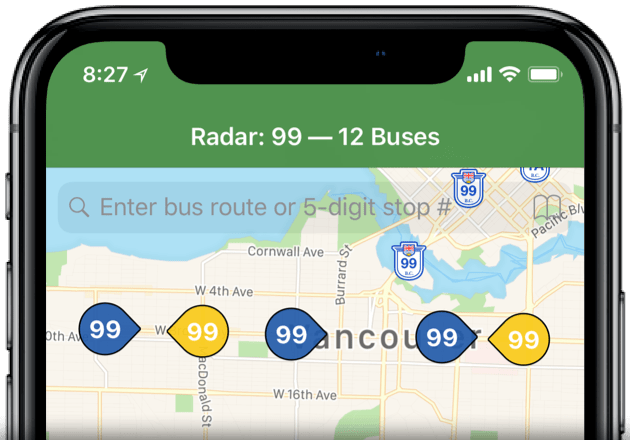 Radar shows you live, up-to-the-minute bus locations in the Metro Vancouver public transit system. How do I use Radar? Bus locations are typically accurate to within 1–2 minutes and several car lengths of when and where the signals were sent. You can tap on a bus location to see exactly when the location was sent. Radar is only as accurate as the information given by the public transit agency, which can vary based on multiple factors. Please allow extra time when travelling. Some markers have a dashed border. Some markers are translucent. What does all that mean? A dashed border indicates that the location is becoming outdated — 60 seconds or older. A translucent marker indicates that the location is very outdated — 120 seconds or older, and that the bus is likely not at that location anymore. How do I tell when my bus will arrive? Radar is a visual way to plan your trip. 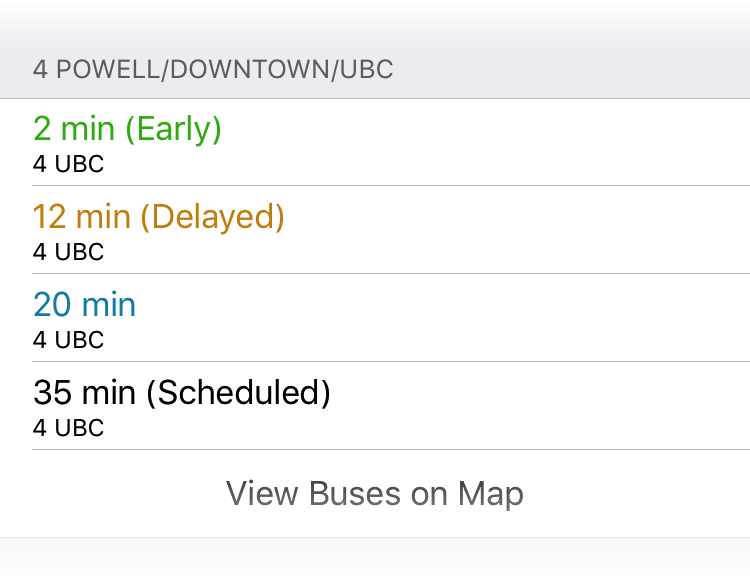 Knowing where the buses are right now allows you to decide when to leave for the bus stop. Give it a try! When you get to the bus stop, you can even enter the 5-digit bus stop number, typically printed in yellow on the sign, and Radar will give you more information about that stop. Tap on the small “i” to see estimated next bus times for that stop. In fact, Radar gives you more information than just bus times. The destination is listed under the time. The colour of the time itself tells you about the status of that bus. Blue means real-time estimates. Green means the bus is ahead of schedule. Orange means it is behind schedule. Scheduled means it is showing the scheduled time because real-time data is unavailable. Bus times are estimates provided by the public transit agency, and their accuracy could vary based on multiple factors. Please allow extra time when travelling. How do I find nearby bus stops? 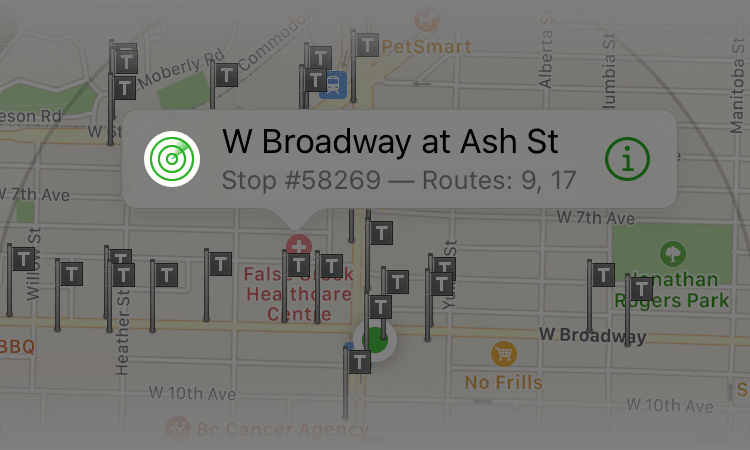 To find nearby bus stops, simply tap the location button (bottom-left corner on iOS and bottom-right corner on Android), or zoom in closer. Radar shows bus stops that are within 600 meters from the center of the map. A circular overlay highlights the search area. 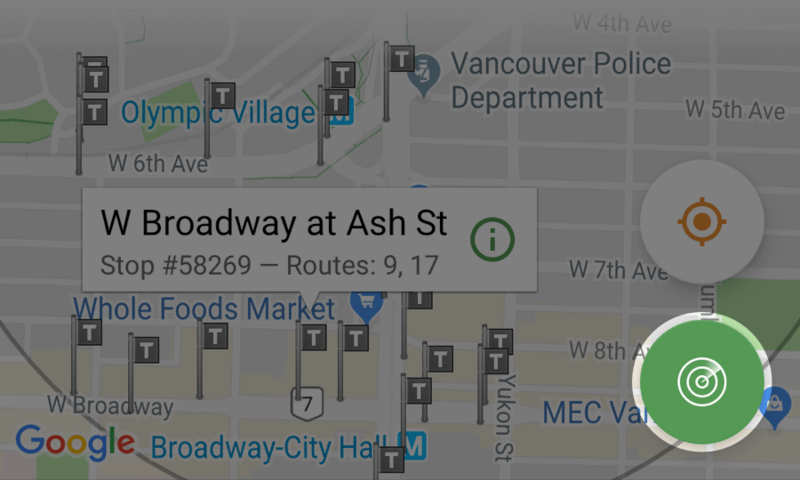 You can view buses for a particular stop by tapping on the green Radar button. On Android, the search button turns into the Radar button when you tap on a stop that is not currently selected. How do I see where I am? Your location is shown as a pulsating green or blue dot on the map. Tap the location button to center the map to your location. If that doesn't work, you may have to enable location on your device and give Radar access to it. On iOS, return to the home screen, then go to Settings > Privacy > Location Services. Make sure Location Services is turned on. Also make sure it is set to While Using for Radar, which is in the app listing further down. On Android, return to the home screen, then go to Settings > Location. Make sure Location is turned ON. Also check the app-specific setting further down in Radar > Permissions > Location. This may vary by device manufacturer or Android version. Bookmarks allow you to quickly search for bus routes and stops, without having to type them in every time. To create a bookmark, first search for the route and/or stop as usual. Then on iOS, tap Edit > Filters (1 Filter / 2 Filters) > Add to Bookmarks. On Android, the Filters button is next to the bookmarks button in the top-right corner. You can give the bookmark a custom name, such as Home or Work. To see and use your bookmarks, tap the bookmarks button in the top-right corner. When you select one of your bookmarks, and Radar will search for bus locations using the route and/or stop for that bookmark. We'd love to hear from you! Follow @TwoRails on Twitter, or send us your questions or comments using the form below.